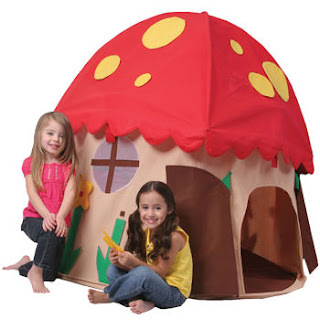 I'm thinking that this toadstool play tent would be perfect for my fairy tea parties I plan to throw this summer. I'd set it outside for the children (dressed in fairy and pixie costumes, of course) to play in, while their parents enjoy fairytale-themed libations. This adorable mushroom tent is also available at Costco and on Amazon.